Published on Monday, May 16, 2016. This article appears in the April/May 2016 issue of American Craft Magazine. 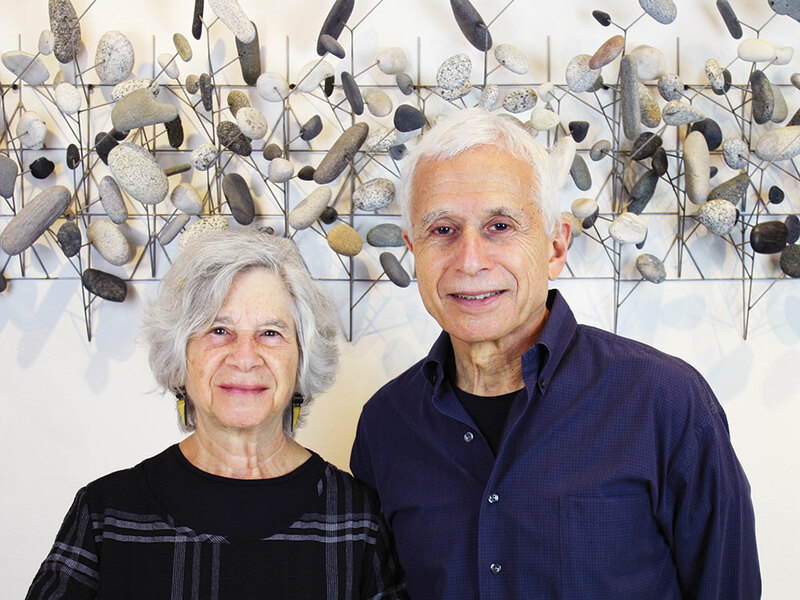 For Ruth and Rick Snyderman, selling art has been a lifelong affair: Ruth opened the Works Gallery in 1965, with Rick joining her seven years later. The Philadelphia couple has mounted landmark exhibitions of legends such as Bob Stocksdale, Wendell Castle, and Toots Zynsky. Along the way, they’ve spearheaded efforts to build public interest in the arts, from marching in parades on South Street to helping found the city’s First Friday open gallery night. Most recently, the couple began working as consultants for residential and commercial building projects, as well as for individual clients. More of an expansion than a change, it’s yet another example of the Snydermans’ commitment to their city and the arts. 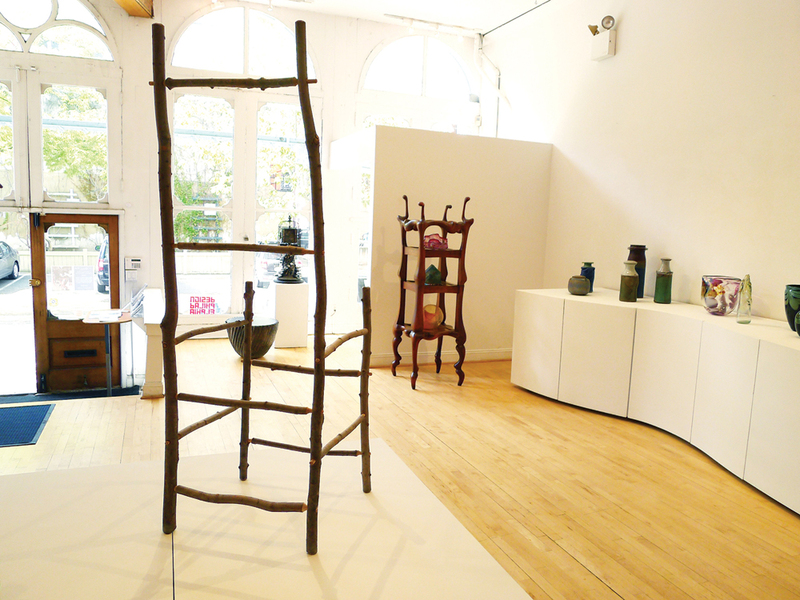 It seems like community – even a sense of family – has always been a key aspect of the gallery. Ruth: Yes. In the early days, Rick and I used to go up to Maine, and we used to gather ceramics, mostly. We would go to all the artists’ homes and pick out the work, and then they would come down and deliver it and stay with us. We had a relationship from the very beginning with many of the artists. And we still feel that way. Half our life is involved in community and the other in the arts. From your first location on Locust Street to your current building in Philadelphia’s Old City, you’ve also been civically engaged in each neighborhood. Rick: Many people who run galleries are focused on the success of the gallery, which is, of course, important. But for us, the success of our lives in the context of a community is equally important to what we do with the business. And I think that’s a luxury, perhaps, that many galleries, which are dealing with rents and development, don’t have. Ruth: We owned our building on South Street, where we relocated the Works Gallery in 1970, and we lived above it. And we own this building in Old City, and we live above it. So the expenses are fixed, the rates can’t go up, and we don’t get pushed out. Rick: It’s been very much a life experience, different from running a business. How has that influenced your current approach to selling art? Rick: There are not too many galleries in this field that can look back and tell all the things that have happened for 50 years in the field of American craft. So that’s given us a very interesting perspective. We are now at a point when galleries are not so popular anymore – where many galleries that are very successful are in basically very wealthy enclaves where people have second or third or fourth homes. But we’re still basically this “little bit of everything for everybody” place that has its roots in the populism of the ’60s – but is a very sophisticated showroom. Ruth: I’m not going to the [out-of- town] craft shows anymore, although I do go to the Philadelphia Museum of Art Craft Show. But we are not doing the SOFA show in Chicago, which we’ve done for 20 years. So that part’s changed for us. Rick: Art fairs are fun to do because we love people. But Ruth is 78, and I’m 79. So you say to yourself, “Hmm, do I really want to do this forever?” [Laughs.] What we are sort of walking away from is this extraordinarily labor-intensive business of standing on your feet 12 to 14 hours a day. And you’ve added new consulting work. Rick: It’s a whole new direction we’re going in – to take all of this information we’ve collected in our heads for 50 years and say, “You know what? If you talk with us, we can actually put together a very interesting program for your space or apartment building or your development.” We’ve never done it before. But why not? The fun has always been in looking for opportunities to do things differently. 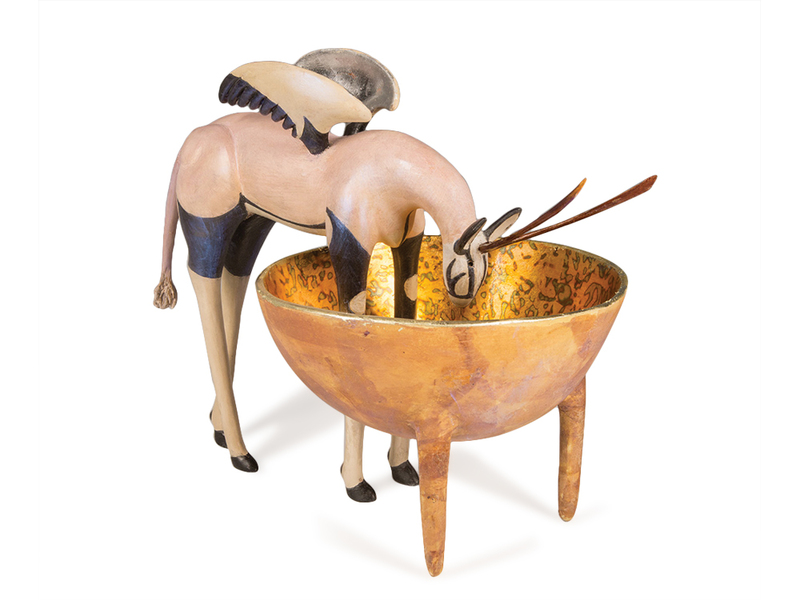 Gretchen Ewert, Winged Deer, 2014, ceramic, mixed media, 13 x 15 x 10 in. Last year, the Snydermans celebrated 50 years in the arts with an exhibition curated by their son, Evan Snyderman, of R & Company in New York City. 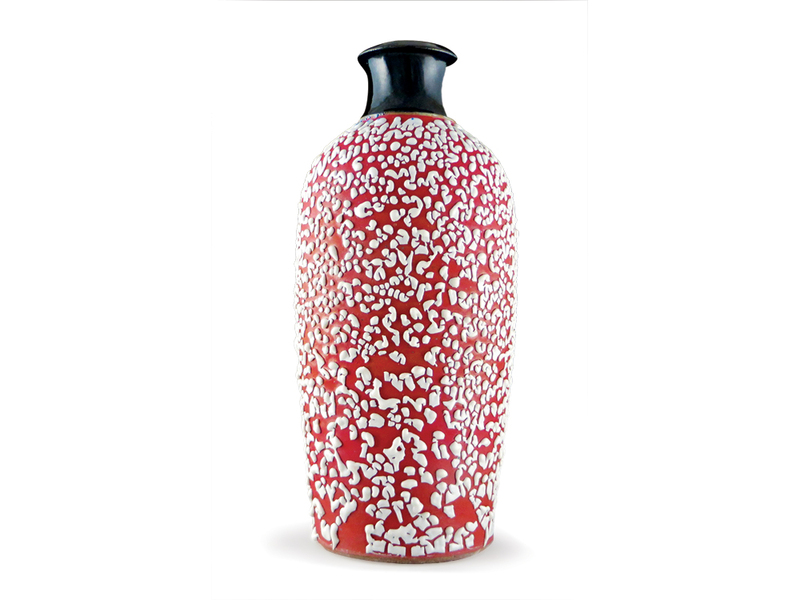 Ceramic art, such as this Skeffington Thomas vase, is a mainstay of the gallery.